All of Northern Ireland is blossoming under the warm sun of peace. This is wonderful news for golfers looking to experience the full range of Irish links courses such as Castlerock Golf Club in Castlerock on the northern coast. The club, founded in 1901, is home to two courses, the original 18-hole, 6,805-yard, par-73 Mussenden Links and the 1970s-vintage, nine-hole Bann Course. While golf for the masses may be a recent phenomenon in the Czech Republic, that doesn't mean there aren't clubs with a rich tradition and storied history. Take the Golf Resort Karlovy Vary, for example. Dating back to 1904, the course has become a favorite for travelers, locals and especially corporate guests who come from all over Europe. Westerners who take a trip to central Europe, and Prague in particular, may want to consider a side trip to this region. It would be worth it. For a course in its first year, Loreta Golf Club Pysely is in remarkably good shape and should only get better in a short amount of time. As it is, Loreta has created a lot of buzz in the Czech golf world, which is obvious when you come to the course, given the full tee sheet (green fees in the $50-$70 range) and membership (the semi-private club already has 700 members). The New Course at Headfort Golf Club in Co. Meath is the perfect complement to the existing Old Course, which has been around since 1928. With four sets of tees, it accommodates most levels of play but probably is a little more geared toward the intermediate to advanced player. Overall, however, this parkland gem is a change-up from the great links courses in Ireland. The Montgomerie Course at magnificent Carton House just outside of Dublin is not quite parkland, and it's not quite links. Rather, it's a combination of both, and it's quite unique, much like its designer, Colin Montgomerie, who has always had his own way of looking at things. With a river that runs alongside the boundaries of the Montgomerie, the course is both beautiful and challenging. Couple that with the 145-room Carton House -- which dates back to the early 1700s -- and you've got a terrific golf escape, especially if you play the O'Meara Course as well. Darren Clarke learned to play the game at Dungannon Golf Club, a pretty parkland course right in the middle of Northern Ireland. While the course is pretty enough and the green fee is almost embarrassingly reasonable, the appeal of Dungannon is the opportunity to pay homage to the 2011 British Open champion, Clive Agran writes from County Tyrone. Portmarnock Links does not have history on its side. But the course, which opened in 1995, has everything else going its way -- a playable Bernhard Langer layout, an affordable rate, a historic golfer-friendly hotel and a seaside setting filled with dunes just minutes from the Dublin airport, Jason Scott Deegan writes. All of the finest links courses around Dublin have hosted the European Tour's Irish Open at least twice. It's probably the only reason why the Island Golf Club constantly flies under the radar when it should be considered 'the' links course to play around Dublin. The words "pure links" are tailor-made for The Island -- the Irish Sea and the Malahide Estuary surround the exposed site on three sides. But it's The Island's dunes that make its competitors look like mole hills. The undisputed jewel in Costa Brava, Spain, is the Stadium Course at PGA Catalunya Resort. And it's not hard to see why it rates so highly on so many lists. It has everything you look for in an outstanding golf course -- self-contained holes that offer a variety of challenges, wonderfully true greens, superb condition, fabulous views and dramatically elevated tees. Royal Cinque Ports Golf Club -- or Deal as it is locally known -- was once a fixture on the Open rota. But bad luck and natural disasters caused this classy links, located in Kent, England, to be removed from the rotation. More than 60 years on, Deal hopes to again host the Open. If the R&A do decide to add another course to the rotation, it's hard to think of many that can outclass Royal Cinque Ports. Anyone who relishes the unique thrill of links golf will feel their pulse quicken as they approach Doonbeg Golf Club in County Clare, Ireland, and see the great dunes looming up on the horizon. These 100-foot mini mountains are a highlight of visitors to one of the loveliest golf resorts on the Emerald Isle. Course designer Greg Norman succeeded in building an Irish course in Ireland by keeping it as natural as possible. Just northwest of Dublin, Ireland, the golf course at Killeen Castle is a fitting venue for the 2011 Solheim Cup. The 12th-century Norman castle, golf course and gardens sprawl over more than 600 acres of meadows and woodlands. Fanning out from the castle, the Jack Nicklaus Signature Course is an interesting combo of links meets parkland with thick grasses, subtle greens and tough bunkers, Katharine Dyson writes. With towering dunes, delightfully springy turf, innumerable bumps and hollows, sea views and a constant breeze, Royal St George's Golf Club -- the 2011 British Open host -- has all the elements that make links golf the thrilling experience that it is. Although obviously a "trophy course" that you can brag about having played when you're back home with your friends, it is also a glorious experience of links golf at its very best. Royal Blackheath Golf Club is a traditional parkland layout, but the rich history of the club is anything but ordinary. The oldest golf club in England, Royal Blackheath has the finest collection of golf memorabilia anywhere. That alone is worth the visit. Clive Agran has more. The European Club in County Wicklow is the realized dream of Pat Ruddy, a ruddy Irish character, collector of golf books, publisher, golf writer and architect of 36 courses. There are only about 160 true links courses in the world, and this one is worth playing. That's because The European Club is not just an exceptional golf course, it's exceptionally unusual, Katharine Dyson writes. Frequently compared with Loch Lomond in Scotland and clearly destined to be up there with the best of them, Lough Erne Resort is living testimony to the new age of optimism that is dawning right across the six counties of Northern Ireland. From the moment you enter through the imposing wrought iron gates, you're conscious of being somewhere special, Clive Agran writes. About 40 miles up the coast from Royal St. Georges, where the 2011 Open Championship will be held, Rye Golf Club in East Sussex, England is a course visitors should definitely play if at all possible. While it may be difficult to get on, it is certainly worth the effort to try, Clive Argan writes, adding that, "the whole experience is about the nearest thing to P.G. Wodehouse that you'll find in the 21st century." Beaches attract visitors to the town of Porthcawl from Wales' most industrious city of Cardiff, which is about 25 miles away. Once you hit the course at Royal Porthcawl Golf Club, a different kind of sand takes your attention - the sand in the sod-walled pot bunkers. 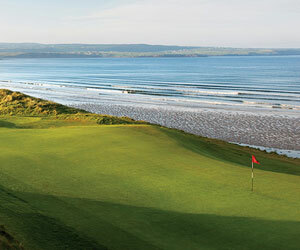 But there is design genius outside of the bunkers at Royal Porthcawl, Brandon Tucker writes.